One thing I hear all the time, is people wishing they were able to draw, that they envy artists their talent and bemoan their own lack. Well I am here to tell you that, although we may not all be a da Vinci, we can all draw given the right instruction and mind set. In another article – How to Find Your Right Brain Inner Artist as an Adult – I have detailed a range of resources to help you to develop your inner artist so I won’t repeat them all here – what I would like to concentrate on is a review of a book, courses and DVDs that has helps millions of people to pick up a pencil and sketch pad for the first time since childhood. 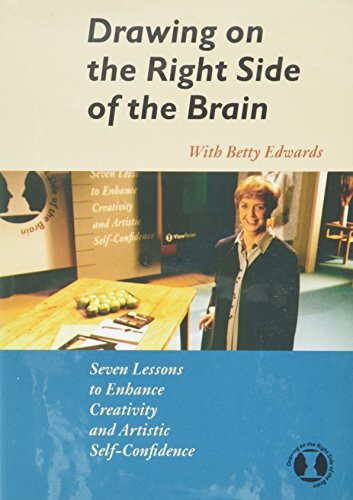 Drawing on the Right Side of the Brain by Dr Betty Edwards was first published in 1979 and has been a best-seller ever since – and with good reason. 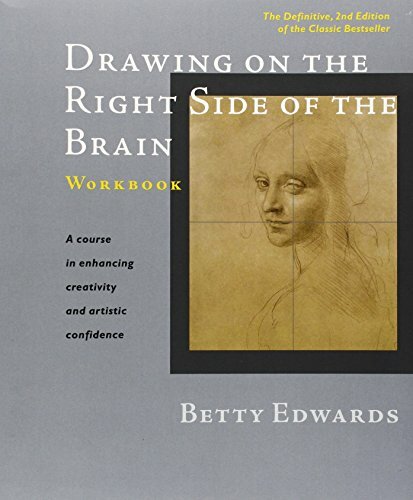 The book works through easy exercises that basically teach you to look at things differently to develop the creative right side of the brain. Read on to see if this might be the right thing for you. Everyone can draw! Yes, you too! I often hear people say they can’t draw a straight line, meaning they can’t draw, but I am here to tell you that just isn’t true. To set the artist in you free, it isn’t that you need to draw a straight line, but you need to draw a straight line upside down. OK now I’ve lost you – but it will become clearer as I go on. What I am actually saying, is that you need to start looking at things differently. In effect by taking this approach you actually start to use the creative side of your brain. Everyone knows the brain is divided into two hemispheres, the right and left. What you may not know is that the left side of the brain dictates logical, practical and linear things while the right brain is responsible for the more creative side of things. The right brain doesn’t always follow straight lines to a conclusion, it is the ‘Eureka’ side that seems to arrive at a conclusion without going through A-to-Z steps. It is the creative part of us. 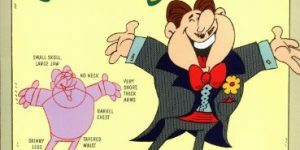 You need to remember the brain is like a muscle and if you don’t exercise it, it becomes metaphorically flabby and lazy. I first came across this book soon after it was published and it was a revelation. People who have an inbuilt talent for art often dismiss people who don’t. I had met many folk who desperately wanted to be able to draw, even it was something simple, and folk who felt a craving to be more creative but were put off by art classes that concentrate too much on technical ability. This book is for them. It is easy to understand and takes the reader from naught to take-off in a very short time. The book won’t make you into an artist, but it will give you the insight and the ability to develop a skill. 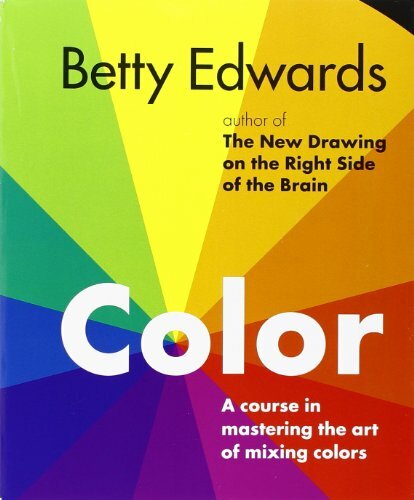 Edwards teaches you to turn off the analytical side of the brain to allow the creative side to become more prominent. One of the most striking exercises involves turning a picture, (in the first instance a chair,) upside down so your brain doesn’t immediately recognize it and name it as a chair. Instead if you concentrate on the shapes and edges, on the light and shadow and draw what you see – when you turn it up the right way, you will have a chair. Similarly, by concentrating on negative space, the spaces between lines, instead of the object, you draw what you see. The results are actually quite remarkable. This isn’t a book for experts. It is very much a first step that will give you the confidence to pursuit art further if that is what you want. Many people are happy to stop here and that is perfectly fine. Others have found this has given them the confidence to be able to go on to explore art classes and to develop their talent and that is wonderful. Whatever your aim, this is one book and course that I can highly recommend. 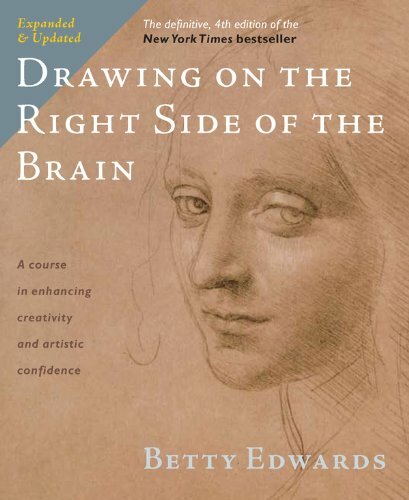 I think this edition marked something like the 20th anniversary of the first edition and it appears to have quite a bit more relating to understanding the processes of the brain that we use in creative pursuits. Not every reader seems to find that a good thing and many admit to skimming over quite a bit of it – but that’s okay. I think the strength of Edward’s books and courses is in applying the exercises for complete beginners, for people who have no confidence in drawing being a skill-set that can be learned. If you are one of the many people who learn visually, the DVD is the way to go. I don’t think you necessarily have to buy all the equipment that is mentioned in the video unless you really want to. You can follow allow with quite basic supplies like drawing pencils and paper and a suitable eraser. This isn’t for experts – it won’t advance drawing skills if you already produce good work, it is very much aimed at those who have never drawn before and who are maybe afraid of the whole process. It is an excellent confidence builder. Dr. Edwards talks you through her course. If Drawing on the Right Side of the Brain has kick-started your artistic side, you might find this book on color the next step forward. In her usual way, Edwards talks through the concepts of color that are easy to understand and lets you pick up things very quickly. Once again, this may not be the book for anyone well versed in art, it is geared for those who struggle with the belief that they too can express themselves in this way. Need a Kickstart to Your Drawing? If you feel that your brain has run dry of ideas or your muse has left you, this book is an excellent way to kickstart your drawing again. Interesting. I have always wanted to be able to draw. I know my son tells me there is a place int his world for stick people but I always wanted to do more. I will have to read this book. I know I have this book in my room somewhere! I bought it and never really used it, but you’ve inspired me. Hope you will give it a second try. I would love to improve my artistic ability. It would probably give me a greater appreciation for art! This book’s approach sounds helpful. Yes, many people have found it successful. I am woefully out of practice when it comes to drawing. I’ve never been amazing but I used to be pretty decent. Thanks for these tips, I need to try them. This is great information and a topic that is constantly being discussed in our house as far as using the brain and exercising it. I really love that you shared this post. I thought I couldn’t draw, until I went to art school and a professor taught me. It was pretty awesome. You can do anything you put your mind to, you just need to know the basics. I need to dust off my artist skills and get back at it. I miss sketching, painting, and creating! It can be a nice release from stresses. I am definitely checking this out because I can’t draw anything. When we used to play Pictionary, no one wanted to be on my team! My husband can draw well. He has said however that drawing is like anything else, you get better with practice and when you don’t draw for awhile, you loose some of the skill. Always thought that was interesting…since I can’t even draw a stick figure! Drawing definitely takes skill, but can be learned. My husband is always drawing. We have tons of notebooks filled with his drawings. Me, well I can’t even draw a proper circle. I will have to check out this book. While you might not become the next Picasso, drawing can help you let go of your thoughts enough to relax. I like painting and drawing but my logical side can’t seem to let the creative side take the reigns. Thanks for the recommendation! Ok this gives me hope! I really want to be more creative and learn to draw better! This looks like a great book! Wow, how interesting, I wonder if I could have success with this ,I have no artistic ability. How cool would it be to be able to train my brain! You will only know if you try! I like the idea that anyone can draw! I took art in school and never thought I had any abilities, I am no professional or anything but taking the class and then putting in the effort to draw allowed me to give it a try and see new abilities. I think it helps relax your brain from usual thoughts when you concentrate on artistic endeavors.